A goose down comforter is a bedding cover choice which offers practicality all throughout the year, ensuring warmth during the winter and coolness during the summer. Made from the feathers of geese, the idea is that this type of comforter remains both warm and dry without becoming stiff, but instead incredibly fluffy throughout use. Goose down comforters are more expensive because geese are more rare ducks used in making duck down comforters. A down comforter is not to be confused with a down alternative comforter. Whereas a down comforter is light, fluffy and filled with feathers, a down alternative comforter is a choice for those who do not want feathers in their bedding or find themselves needing a cheaper version of an actual down comforter. A down alternative is often recommended as a solution for those with asthma and allergies triggered by feathers in down comforters. Anyway our discussion today will be centered on the best goose down comforters so let’s get into into it. Egyptian Bedding: This is the most popular Brand with their comforters being some of the highest rated goose down comforters. Egyptian Bedding offers a high-end goose down comforter which they claim is perfect for all-year-round use. Available in sizes Twin, Queen, King and California King, the above goose down comforter combine a 750+ Fill power with a 100% Egyptian cotton cover of 1200 thread count to offer a soft and luxurious feel for an enriching night’s sleep. The construction of this comforter ensures that the down is evenly distributed and is prevented from moving around the bed with its unique loop design. There is also a double needle stitch added to avoid any down leakage. Hypoallergenic therefore suitable for people with allergic reactions. It is thick, comfy and fluffy for a soft and luxurious feel. Down filler is evenly distributed to ensure it provides maximum warmth without any cold spots made possible by the baffle box design that holds the down in place without shifting. It is 100% Goose Down. It may feel too hot and thick for some people. It may not be the best bedding to use in the summer unless you prefer to have an AC on, because it tends to get too warm. It makes a little noise when you move in bed which can be irritating to some people. 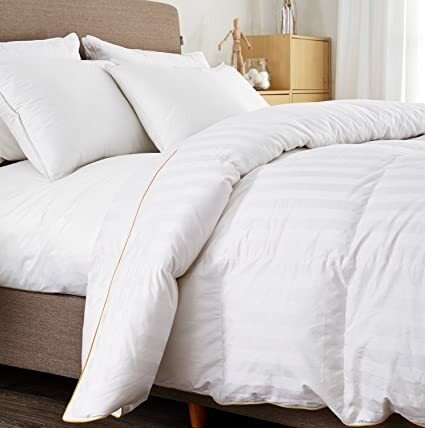 This comforter from Egyptian Cotton Factory Outlet Store claims to be perfect for all year-round comfort because unlike other comforters that get too hot during the night, this one provides medium warmth. With 750+ Fill power of white Goose Down and 50 Oz fill weight the shell is made of 100% Luxury long-staple Egyptian Cotton with a high thread count of 1200. Claims to be 100% Goose Down. Hypo-allergenic therefore quite effective in keeping allergens at bay. Offers a soft and luxurious feel. Shedding reported with some purchases. Puredown claims to provide on of the softest and luxurious comforters with minimal noise to ensure you sleep comfortably throughout the night. This comforter is filled with 75% white goose down and 25% white goose feather for a 600 fill power. The shell is 100% cotton with a thread count of 500. It features piped edges with gold and double needle stitching for a luxurious look as well as four corner loops to hold the comforter in place. It is currently available in Twin, Queen and King. 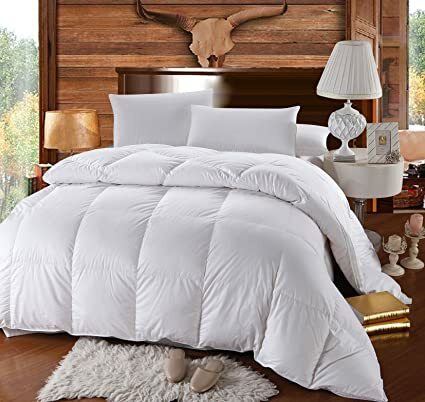 This is a medium weight comforter that provides just enough warmth without getting too hot like other comforters making it perfect for seasons. Baffled box stitch design to prevent any shifting of the down for maximum warmth without any cold spots. Allergen free and guaranteed hypo-allergenic. This comforter boasts of being able to keep you snugly and warm throughout the night, without ever feeling you’re overheating because it not only attractive but breathable as well. This comforter from Snowman is filled with 90% goose down mixed with 10% goose feather. It claims to have a 800 fill power, one of the highest in the market. The cover is 100% cotton with good down proof function and high thread count. Comes in 3 sizes; Twin, Queen and king. In order to be remain light and puffy for years and be able to expand to its maximum, this comforter also features a baffled boxes design. When it comes to washing, only professional laundering and air drying is recommended. Do not machine wash, use bleach on it or iron if you want your goose down comforter to last and remain as good as new. It is resistant to allergy causing organisms. This comforter is relatively light but warm. Relatively fluffy, breathable and most of all, comfortable. Excellently constructed with baffle box design for maximum loftiness and warmth. The comforter may not the fluffiest one around if its fluff you’re after. 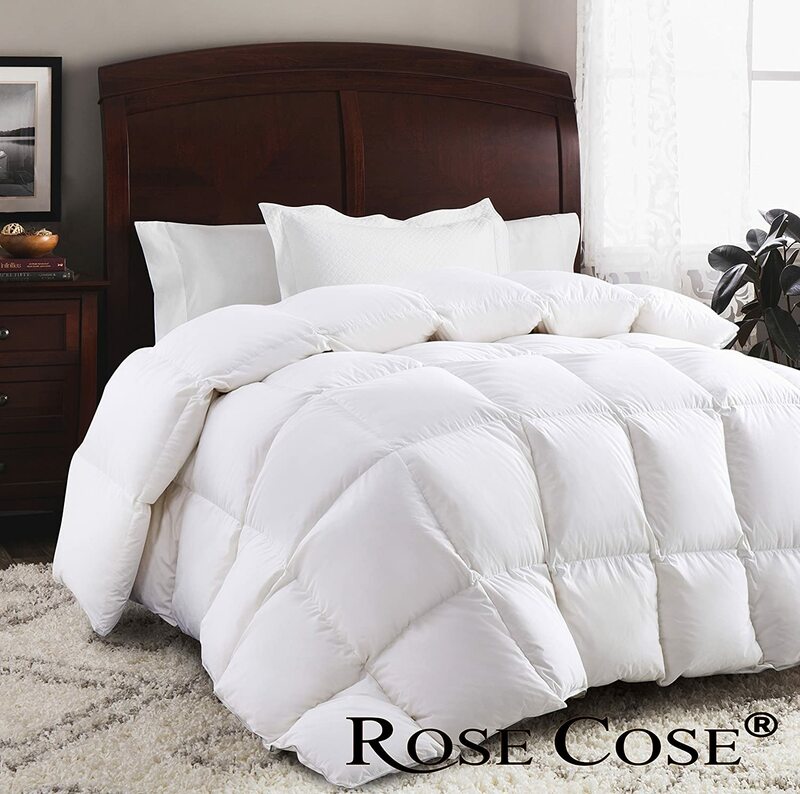 Rosecose’s goose down comforters claim to be ultimately lightweight in design and perfect for all seasons. 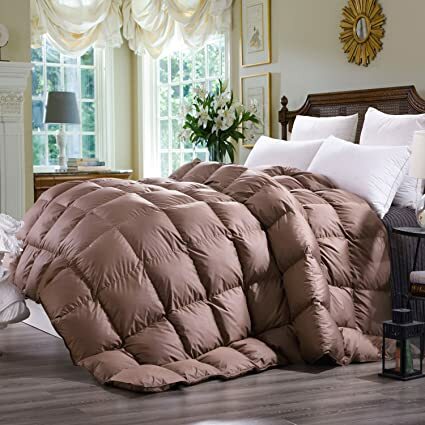 This soft comforter claims to offer luxury combined with warmth all the year round. 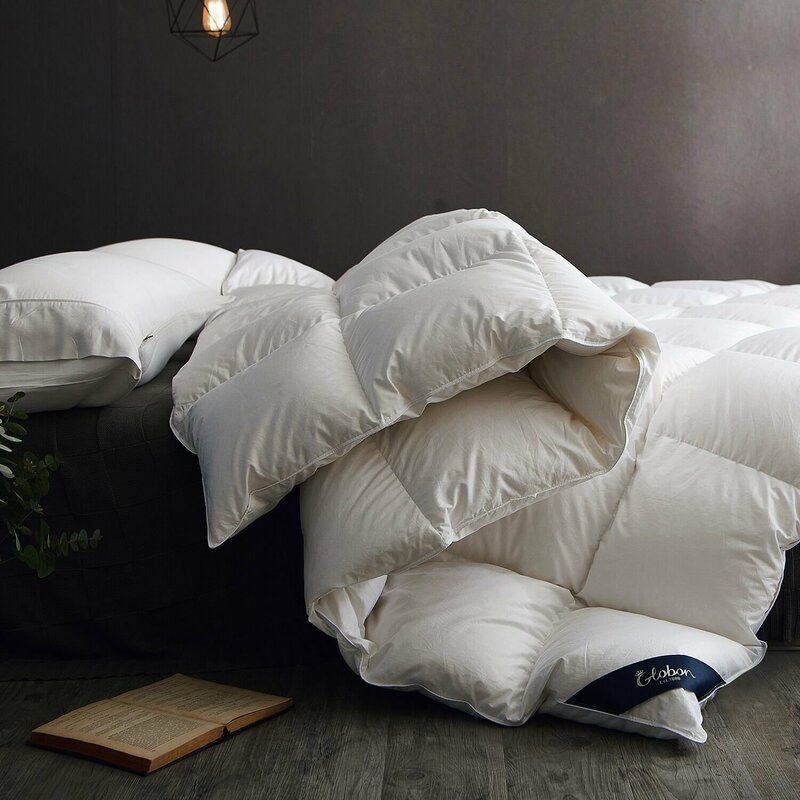 Though they are only currently offered in both King and Queen sizes, they are filled with 100% Goose Down with 750+ fill power, inside a 100% cotton shell with 1200 thread count. Designed in mind to ensure you only need to use just one goose down comforter throughout the whole year, this comforter is evenly distributed for the most refreshing night’s sleep and is finished with a classic robust white patterning to ensure that it fits into almost any home decor. Their latest comforters are 100% Fill With Goose Down. Hypo-allergenic, therefore resistant to allergy causing organisms. Light weight but not to much so as to keep you sufficiently warm. Baffle box design ensures the down stay evenly distributed without shifting while ensuring the down can extend to its maximum loft to provide maximum warmth. May come with a odor that will wear off after some time. Eddie Bauer offers luxurious comforters that are proudly made in the USA using imported materials to produce comforters that are machine washable and dry-able. There are two sizes of this comforter available, King and Queen. With a lightweight fabric, it is breathable and perfect for all use throughout the seasons. Baffle box design discourages any shifting or clumping, keeping the down evenly in place. With a 700+ fill power, this is an hypoallergenic product made from 100% damask cotton striped shell cover with a thread count of 350. Not too light or too heavy, just perfect for providing warmth including in the summer or for Hot sleepers. It is comfy and relatively fluffy. Royal Bedding claims that is comforter has the ability to make you feel like you’re covered in a cloud as you drift off to sleep every night due to its luxurious and soft feel. Available in sizes Twin, California king/King and Full/Queen, this comforter is an all-season product that is created with the finest of down with 750 fill power wrapped in 100% cotton with a 500 thread count to guarantee a plush and comfortably finished product which works in all the seasons. The hypoallergenic cotton cover with baffle box design is certain to provide you with optimal warmth throughout the night. Light but still bale to provide sufficient warmth. Plush and soft for the ultimate comfort. Seems that for some purchases, it started shedding after few uses. C&W has been in the business of quality down comforters and down pillows since 1996 serving both the domestic and international markets. 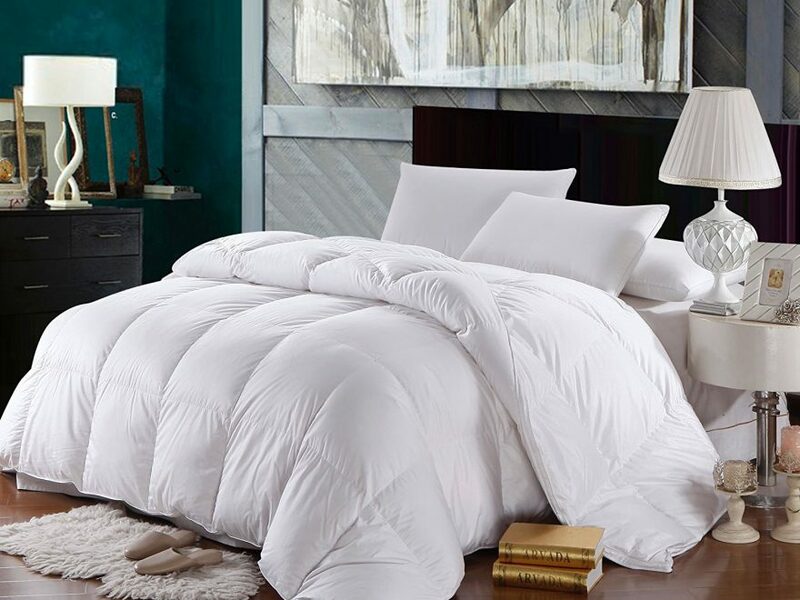 The filling for this incredibly beautiful yet functional comforter is this is 50% goose down and 50% goose feather for a 600 fill power wrapped in a customized non-fluorescent soft fabric cover made of 80% polyester and 20% cotton. It comes in only Queen and King sizes. Light weight with just the right warmth for all season use. The baffled boxes construction holds the down in place without shifting hence allowing the down expand its maximum loft and provide with optimal warmth without cold spots. The fact that the top cover is more of a polyester fabric than cotton may not sit well with some. Top of the price range, Globon offer the maximum in warmth with their goose down comforter. 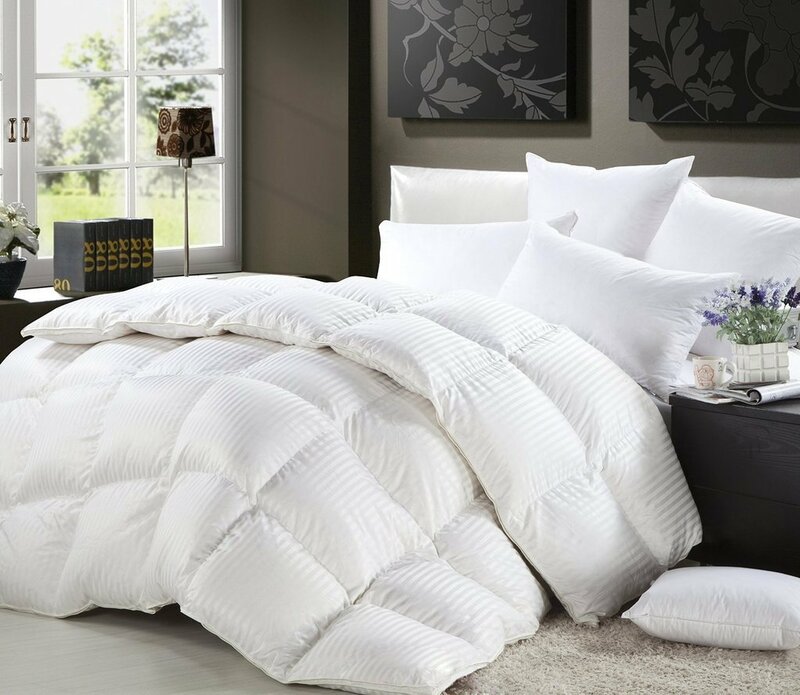 Available in sizes Twin, Queen, and King, these goose down comforters are designed using high quality white goose down and specially imported polyester fibers from Germany for a 650 Fill Power. The shell cover is 100% cotton with a 400 thread count. White in color, Globon offer a comforter that can be machine washed and dries in quick time. With its extreme softness, these products provide extreme warmth and added breathability throughout the night thanks to their improved air circulation and absorption properties. 3D Baffle Box Design, makes the filling evenly distributed, and allows the down to extend optimally for maximum warmth. When it comes to sizes, there are are many sizes to choose including Twin, Twin XL, Full, Full/Queen, Queen, Oversized Queen, King, and Oversized King sized goose down comforters. Depending on how you like your comforter, whether you like the size of the comforter matching your bed or you prefer it draping, you are sure to find one that suits your bed. Just make sure you carefully read the sizes before making that purchase. If you’re going to have your goose down comforter inside a duvet cover you, depending on what you want, whether you want your comforter to match the size of your duvet cover or you want your comforter a bit larger than the duvet cover for that extra fluff inside the duvet or you just prefer a larger duvet cover for it to drape, all this you must have in mind when making your purchase. It is essentially a measurement of the comforter’s fluff. Generally, the rule of thumb is the higher the fill power the higher the quality of the comforter. A higher fill power will give you a lighter, more fluffy comforter for a certain level of warmth. In cold seasons, comforters with fill power of 600 to 800 are ideal. Using anything with a fill power over 600 in the summer will most likely cause you to have an uncomfortable and sweaty night. Fill weight refers to number of ounces of down inside a comforter. Generally, both the fill power and fill weight will determine the level of warmth of the comforter. Baffled boxes design is the best style to look for here where the stitches on the cover shell are sewn in such a way that they form boxes. This style is the best because it prevents the down in each box from shifting. The down stays securely in place thereby maximizing the comforter’s overall loftiness for maximum with no cold spots. You may also want to consider the the thread count of the comforter’s outer shell cover the higher the thread count, the finer and more tightly woven a fabric is. Just keep in mind, anything with a thread count of less than 200 is considered low quality. Thread count of 600 and above in the case of down comforters is luxury. Ultimately, some of these goose down comforters may not be the perfect product choices for those people who only want to make use of just the one comforter all year round. However they do have a way of bringing that modern, cozy and fluffy look to your bed which is why they are popular especially for winters.